Even though I went to bed after 3:00 AM I still woke up around 8:30. I couldn’t fall back asleep and I was up for good. I had two pieces of toast for breakfast and I typed out the blog post for Sunday’s game. I also tried to get an interview for a local radio or TV show. I tweeted at a bunch of stations and I’m grateful that 24/7 Phillies 98.1 WOGL contacted me and I did an interview this morning. I thought it was going to be an interview that would air as it’s happening, but it sounds like it will be airing at 3:00 PM eastern time during “What’s the Word.” Anything I can do to help raise funds and awareness for Be The Match is fine by me. 1) The exterior of the restaurant on Fairmount Avenue. 2) The small interior of the place. 3) The menu, which is written on a chalk board that faces the doorway. 4) My lunch. I got the “San Diego” panini, which consists of sliced chicken breast, sharp provolone, roasted red pepper, and pesto. Because I’m never satisfied with a standard order I added caramelized onions and tomato. I also had a bag of Salt & Pepper kettle cooked “Joe Chips”, as well as a 1/2 peach tea and 1/2 lemonade. All in all it was a great lunch, even if it set me back $12.09. When I got back to Mike and Meg’s place I hung out with Bubbles for a bit. 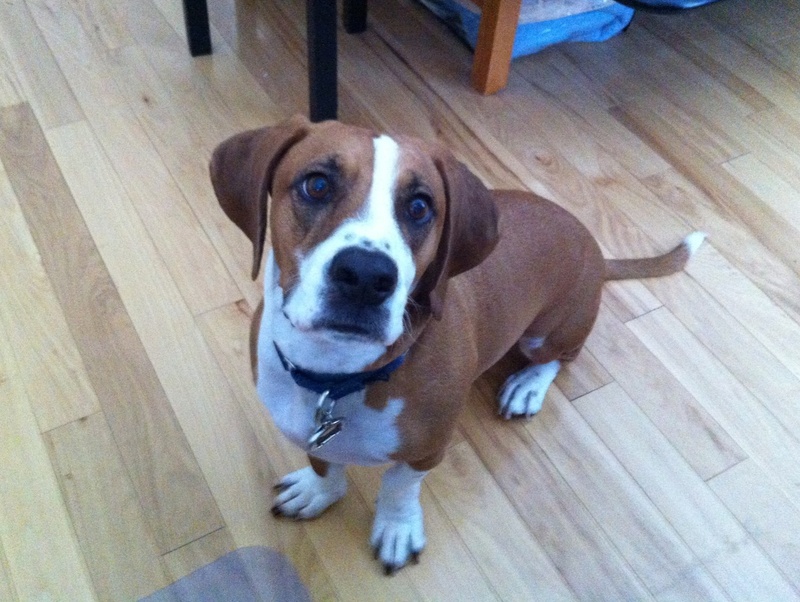 He’s their beagle/basset hound mix is a very friendly dog. Needless to say there are plenty of parking spaces to go around. 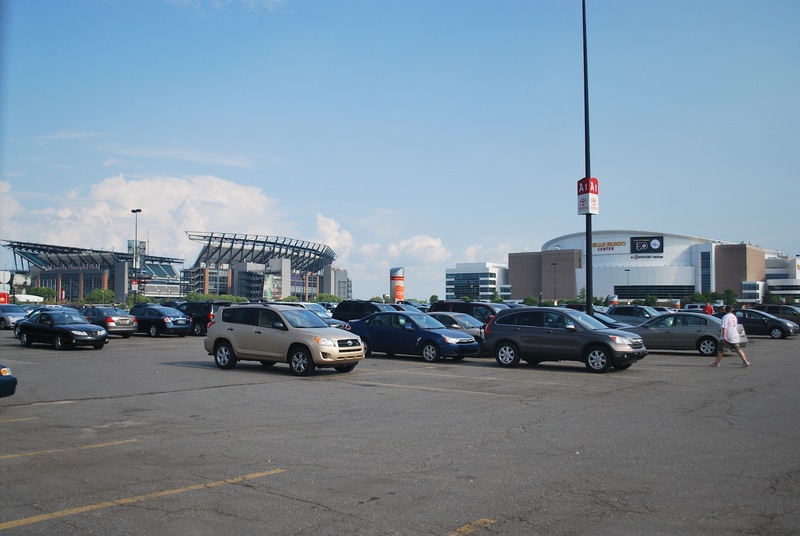 You can see Citizens Bank Park (and the other arenas) right after you emerge from the underground subway stop. 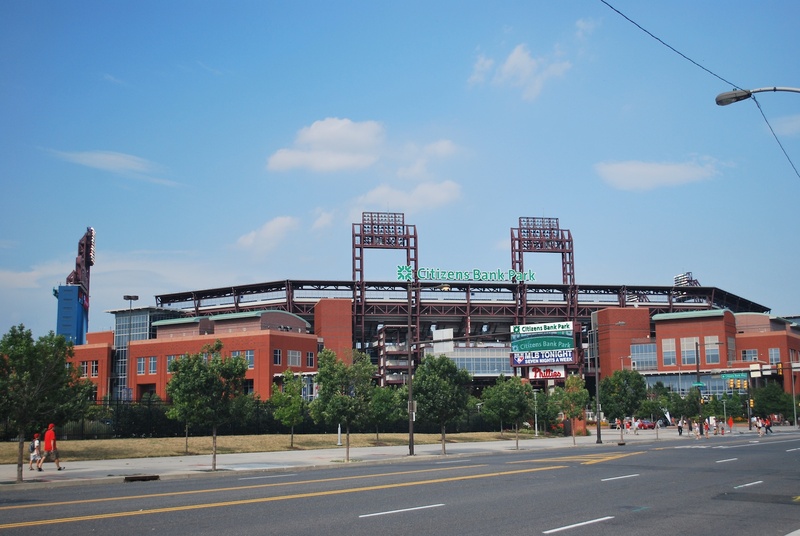 As I got closer to the Phillies’ home I got a picture of the park. 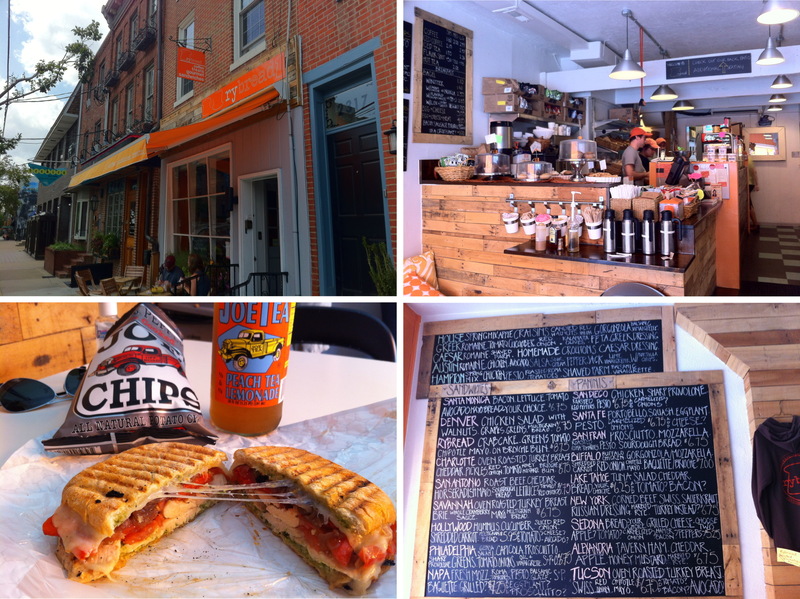 It’s not downtown by any means but there are a few options for food and pre-game activities. Across the street is Xfinity Live!, which, according to Wikipedia is “a high end destination dining, entertainment, and retail complex.” Phase 1 is apparently done but it sounds like they will be adding to it. They have beer, food, and giant jenga. Before a baseball game that’s all fans really want, right? I checked to see if my ticket was available at will call yet (it wasn’t) then got game photo number 95 taken care of. Two nearby Brewers fans were getting their picture taken in front of the Mike Schmidt statue, and I asked for their assistance. It was a father/son duo who were in town for a firefighter convention. Thanks for serving and protecting the Wausau area and for taking the picture for me! 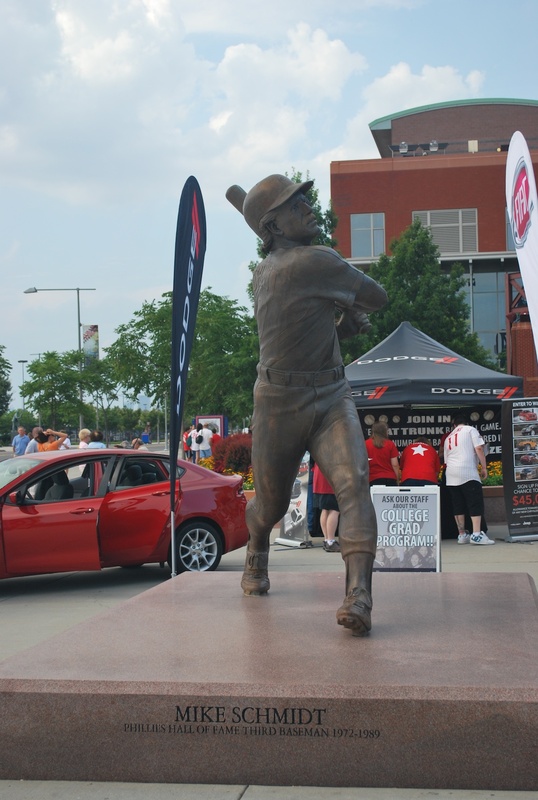 Speaking of the Mike Schmidt statue, here it is. Mike Schmidt played for the Phillies his entire career, from 1972 to 1989. He was a 12-time All-Star, 3-time NL MVP, 8-time NL home run champ, and finished his career with 548 home runs. Oh, and he won 10 gold gloves, all around he’s one of the best and was inducted into the hall of fame in his first year of eligibility. I went back to the first base side ticket windows and waited for the visiting team tickets to arrive. In the meantime I got a picture of the Robin Roberts statue. 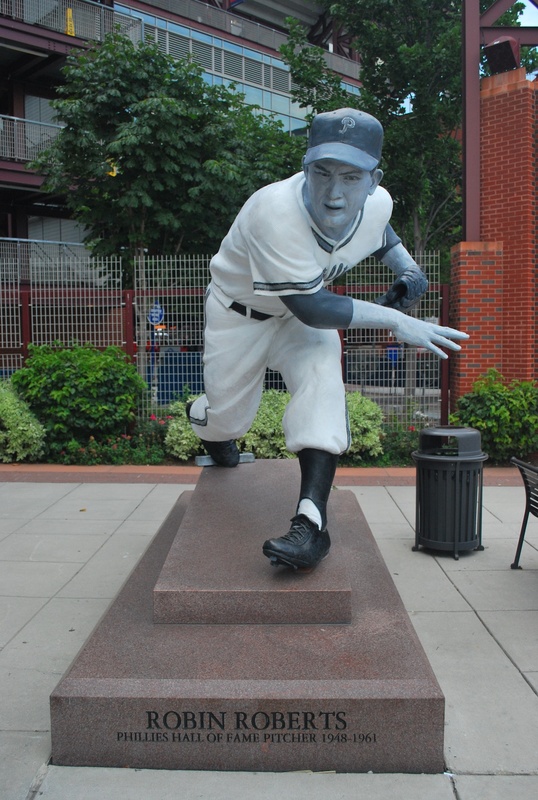 He pitched for the Phillies from 1948-1961 and had stints with the Baltimore Orioles, Houston Astros, and the Chicago Cubs. 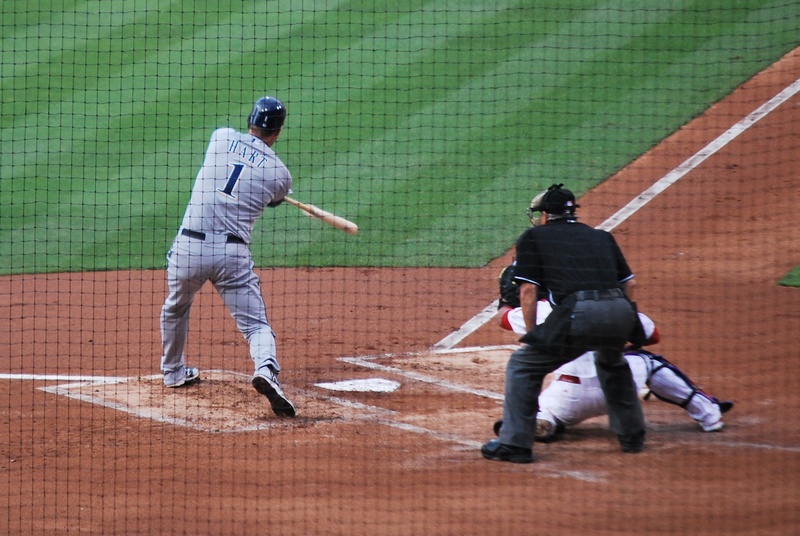 He held the record for most home runs surrendered until Jamie Moyer surpassed it just recently. Despite the home runs surrendered record he was a great pitcher, a 7-time All-Star and was elected to the Hall of Fame in 1976. I got my ticket and was inside the park at 5:45. 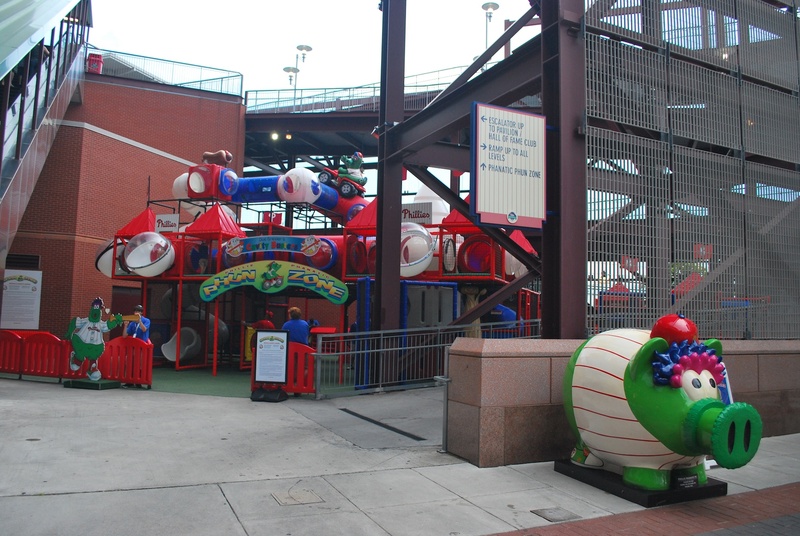 Right inside the first base entrance is the Phanatic Phun Zone. 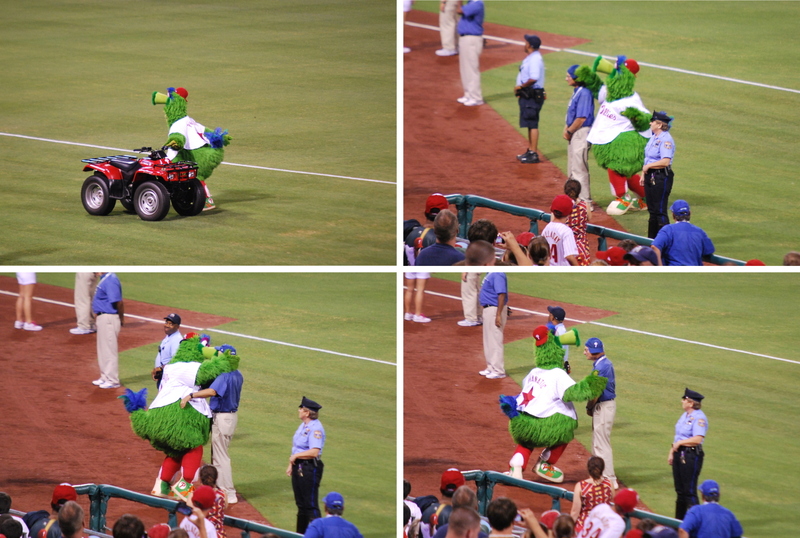 The Phillies mascot is the Philly Phanatic, and the Phillies like to use the P-H whenever they can. Very punny, Philadelphia. I had lots of time to kill so I wandered around and took pictures. In centerfield they have an Illustrated History of Philadelphia Baseball. I actually didn’t get a picture of that because there were people constantly walking past (as they should). It was cool though and detailed the history of professional baseball in Philly over the past 150 years or so. 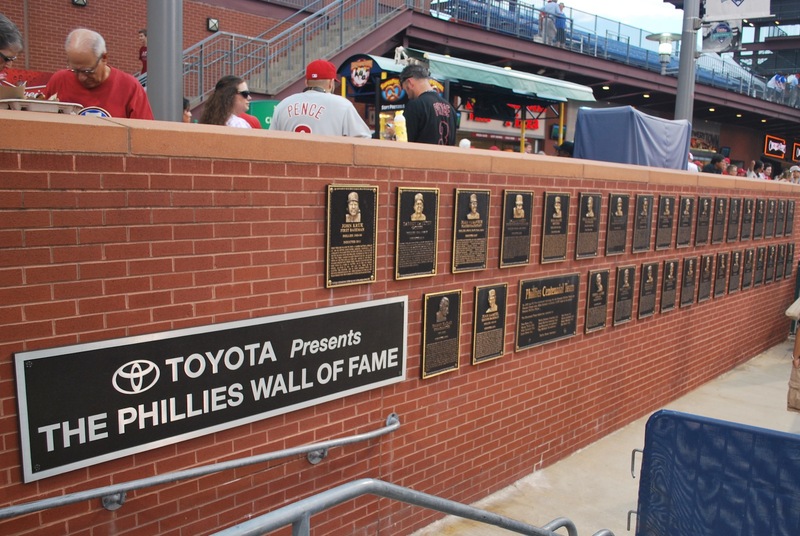 The Phillies Wall of Fame is also out past the batters eye in centerfield. It pays tribute to the players who played for the Phillies over the years, and played well (that’s key). Just to the right of the picture above lies the bullpens. 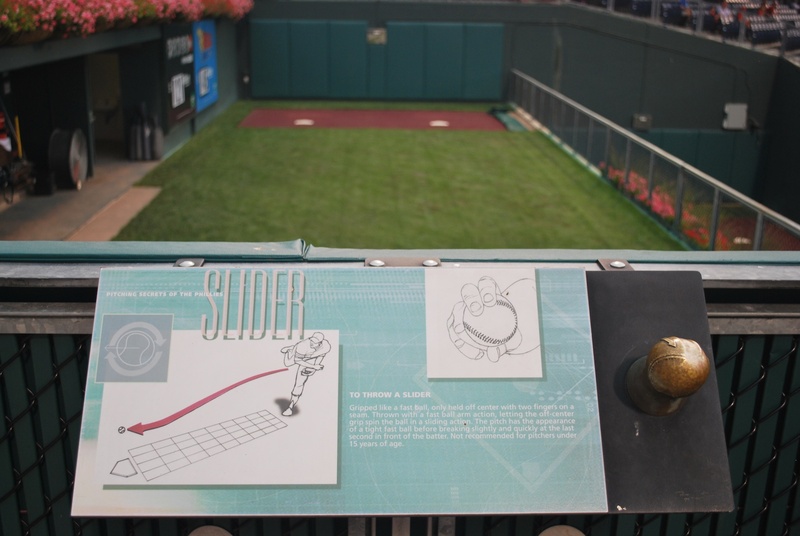 You can look down into the ‘pens and learn how to throw pitches at the same time. My only problem with this slider diagram is that a slider does not move like that. 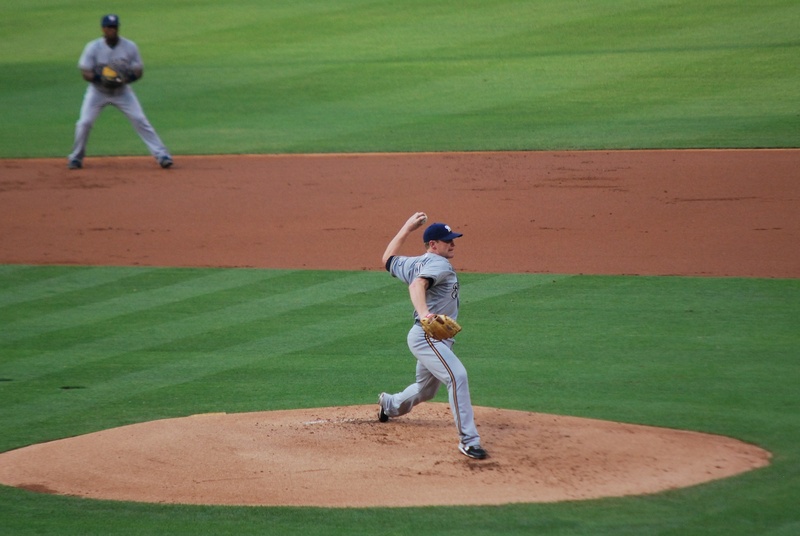 A slider moves across the pitchers body (moves right to left when a righty is pitching). This diagram makes it look like it straightens out and then goes back to the right slightly. On second thought, I think the diagram is trying to illustrate that the ball drops. Either way, it’s a bit confusing. When I was out in centerfield I stopped to talk to a cameraman. I saw that he worked for Comcast Sports Network (CSN), and thought he might be able to help me out. I told him what I was doing and asked if he could maybe talk to his producer and tell them my story (or at least direct them to my blog). He told me to talk to the cameraman on the first base side, and that’s what I did. I stopped by, gave him my card and asked if he might be able to work something out. He said he’d relay the message to Gregg Murphy (Murph), who is the in-game reporter for the Phillies broadcasts on CSN. I told him where I was sitting for the three games but wasn’t sure if anything would come of it. It was worth a try and I’m glad I reached out. 20 minutes later I was sitting in my seat and the second cameraman (Mike) stopped by and said that Gregg Murphy would be doing an interview with me during the game. Nice!!! He didn’t say when but that was fine with me. I hadn’t planned on leaving my seat anyways so it worked out well. It was Italian Heritage Celebration Day at the ballpark and I’m upset that I hadn’t brought my Birrai shirt for the occasion. 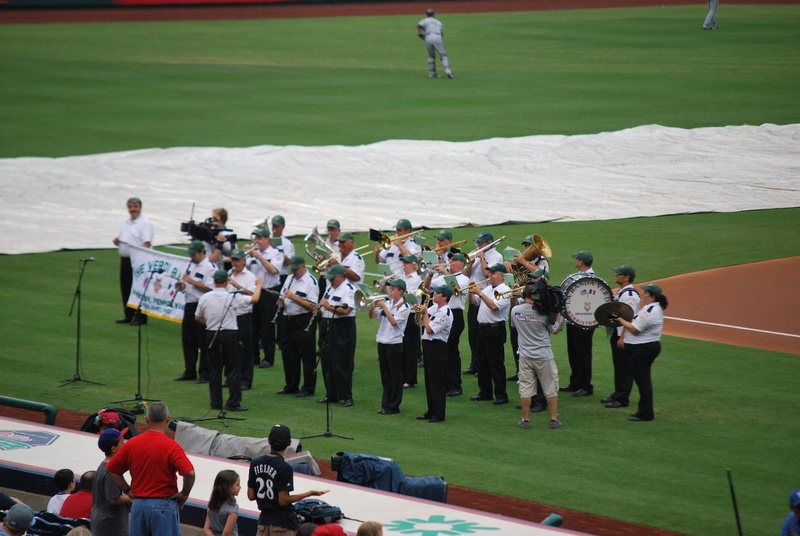 The Verdi Band of Norristown performed on the field before the game. As you can see the tarp was on the field, but they hadn’t covered the infield. It was raining and then drizzling but once the game started the rain was pretty much nonexistent. Speaking of the game, it started a few minutes late because of the weather but Roy Halladay delivered a ball to Aoki to start things off. Corey Hart was up next, and he lined a base hit to left, allowing Ramirez to score. 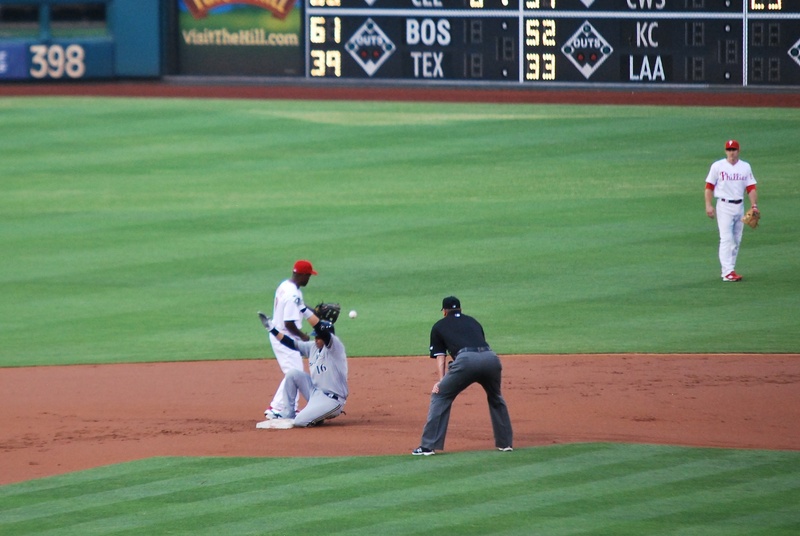 Here’s Hart either right before or right after he made contact with the 1-2 pitch from Halladay. 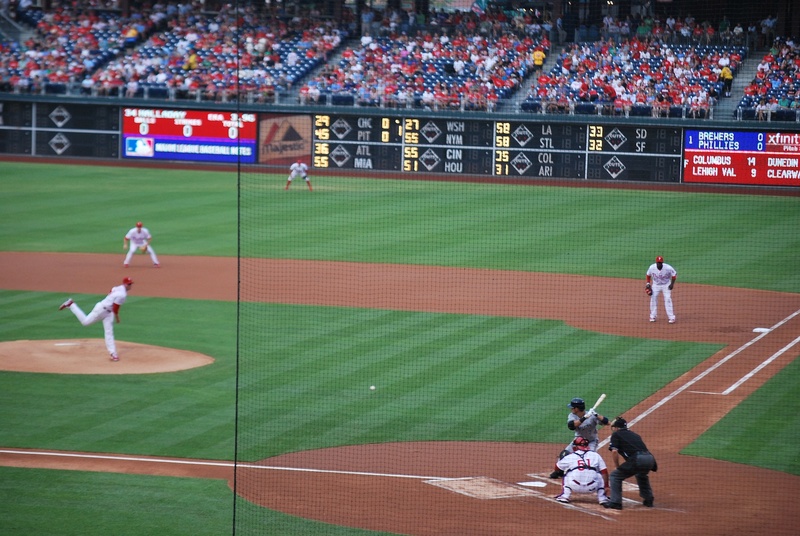 The Phillies would answer in their half of the first. 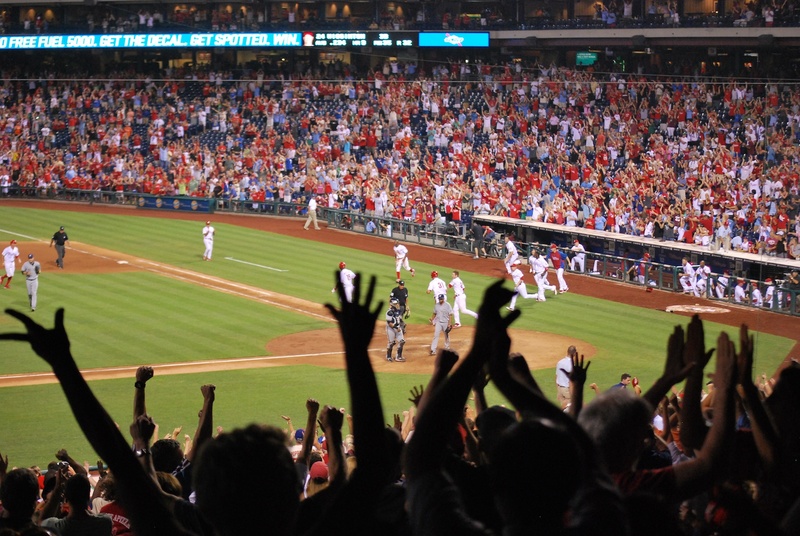 Chase Utley and Ryan Howard went back-to-back with two outs and it was all knotted up at two. Despite allowing the two runs in the first Randy Wolf pitched well and he deserves a mention. Here he is delivering the first pitch of his outing. In the third inning the Brewers took a one run lead when Braun singled home Gomez. 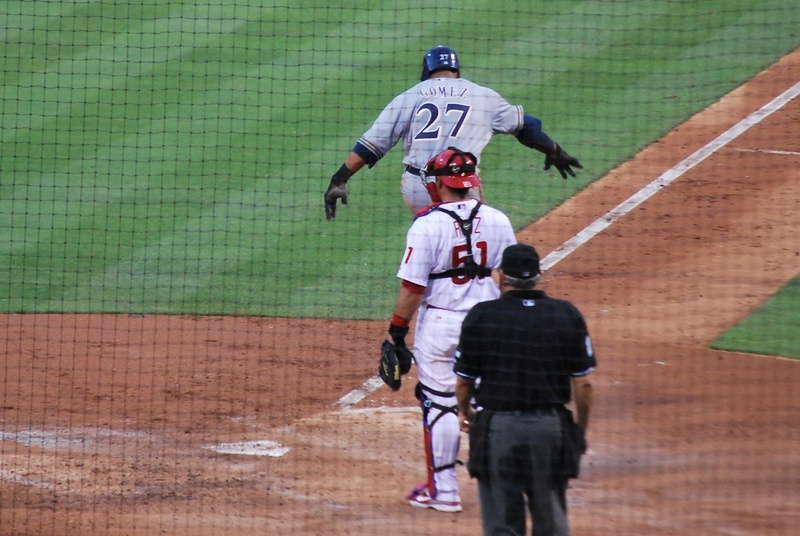 Gomez slid home and did a pop up slide that turned into a leap. Unfortunately the catcher is in the way, otherwise you’d have a better idea of what I’m talking about. Now, I’m sure you noticed the guy who came in from the right side of the screen at about the 41 second mark. 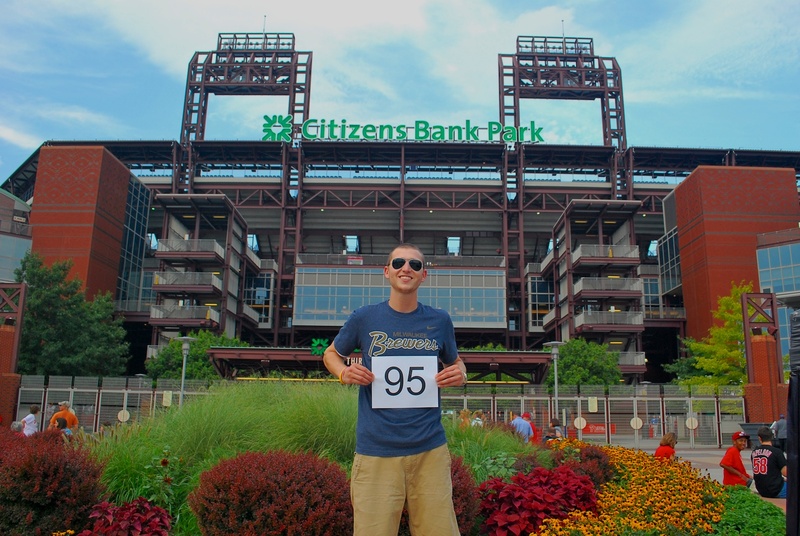 He knelt down right in front of someone else, tried to get in the shot, and then show his Phillies shirt off. After seeing it I realize that he really didn’t get much face time and he looked like a tool in the process. After the interview they went back to me (which I didn’t know). You can see me giving him a thumbs up and saying something. I was telling him what I was doing, and that he probably just looked like a “phool” on TV. All he said was “I respect that but I’m a Phillies fan.” That’s why I’m shaking my head and looking a little ticked off. It probably looked bad to viewers at home so I’m a little upset with myself. Oh well. I want to thank cameraman Mike for informing Gregg Murphy of my story, and Gregg for doing the interview. I also want to thank CSN for agreeing to have me on. It’s been great to see all the support I’ve gotten, thank you! 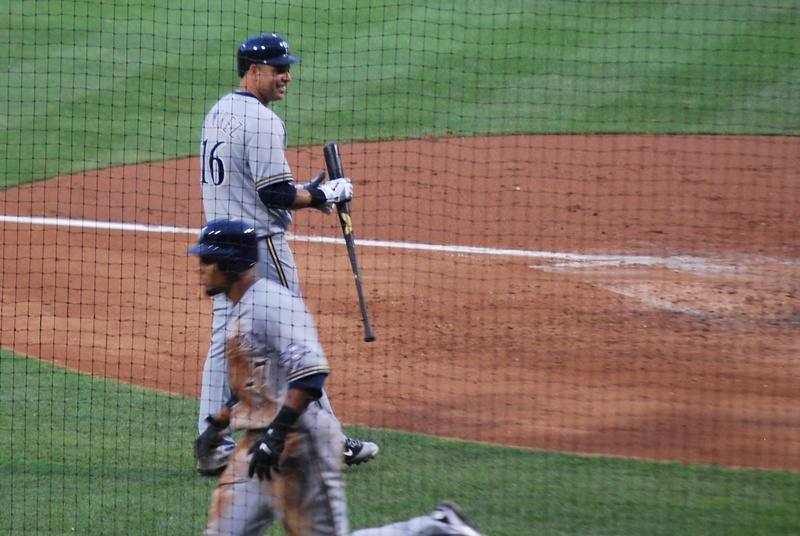 The Brewers gave a run back in the seventh when Kottaras let one get by him and the lead shrunk to three. It remained that way heading into the bottom of the ninth. K-Rod struck out (former Brewer) Laynce Nix and it was looking good. Do you want to know how the game ended? 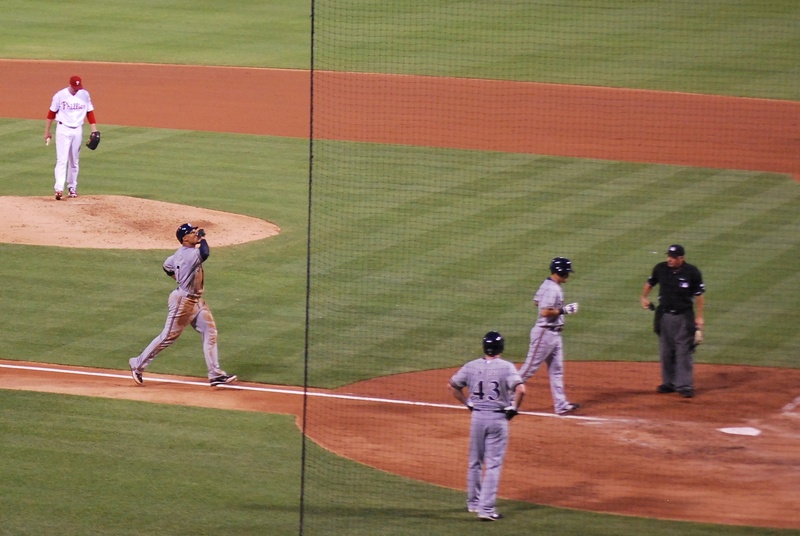 With one out this is what transpired: single, walk, 2-run single, RBI single, walk, walk-off sacrifice fly. 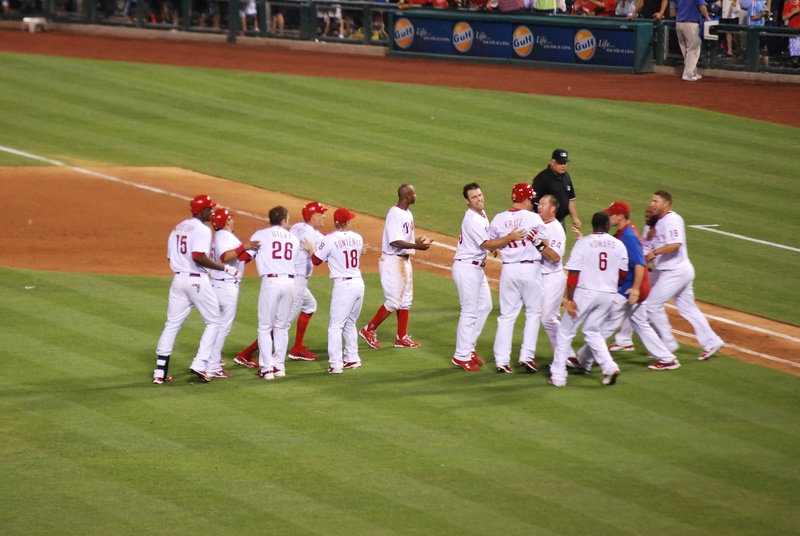 Game over, Phillies win. Final Score: Phillies 7 – Brewers 6. This is why you don’t leave a baseball game early. Thousands of fans left in the 7th, 8th, and 9th (sadly a lot of fans at Miller Park do the same). The sac fly almost was a double play, and Braun almost threw out Kratz but his throw home was slightly off target. On a scale of 0-100, 100 being a perfect strike from the outfield, Braun probably needed an 80 or so, since his was off target I’d give it a 70. It was terrible. I didn’t get heckled or anything, and I actually shook a few hands and said “good comeback.” On the inside I felt like punching a cement wall, but you should never show your hand. Plus, would I rather be working a 9-5 right now? The answer is no, so I’m not going to complain. 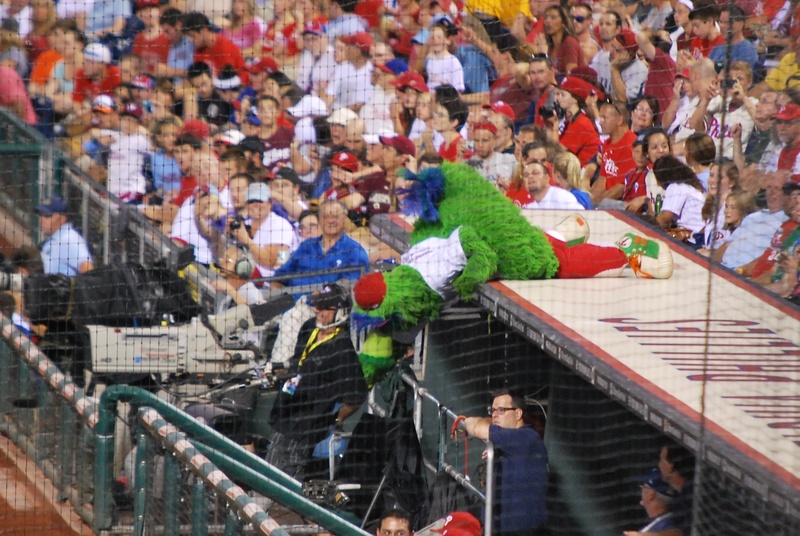 It’s time for a few pictures of the Philly Phanatic, the Phillies’ exuberant mascot. At some point (between innings) he came flying across the field on a four-wheeler. The progression goes clockwise from top left, but it doesn’t need an explanation. I think I’m going to head over to the Eastern State Penitentiary, which is just a short walk from Mike and Meg’s place. It’s historic, run down, and it should be interesting. I will take pictures, they will appear in tomorrow post, that is all.